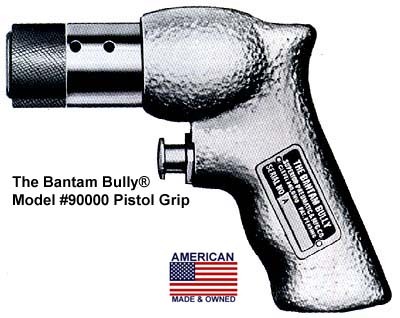 The Bantam Bully¨ weighs only 20 oz. The piston is the only moving part aside from the metering trigger, assuring long life and low maintenance cost. It is used for small part assembly, riveting, weld scaling, inserting Roll Pins, applying air conditioner knobs, upholstery clips, etc., pushing on SPEED NUTS¨ and PALNUTS¨. Weight - 20oz. | Air Consump. at 90 psi - 3 C.F.M. Length Overall - 6" | Bore and Stroke - 11/16 X 3/4"
Length Overall - 7 1/4" | Bore and Stroke - 11/16 X 3/4"
The Big Bully¨ weighs 2 lbs., 4 oz. Its sturdy construction and the minimum of moving parts assures long life and freedom from service problems. 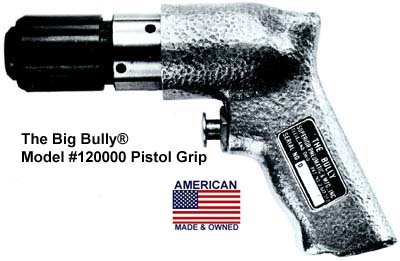 The Big Bully¨ is ideal for heavy weld chiseling and routing, scaling, gouging and grooving, cutting and star drilling, cleaning concrete from ready-mix trucks and fast removal of fins on foundry castings. Weight - 2 lbs. 4oz | Air Consump. at 90 psi - 6 C.F.M. Length Overall - 6" | Bore and Stroke - 3/4 X 1 5/32"
Length Overall - 9 1/8" | Bore and Stroke - 3/4 X 1 5/32"
The Scaling & Chipping Air Hammer has our patented safety chuck. Especially recommended for tuck pointing, heavy weld scaling, cleaning "hard to reach" places, and busting bolts and rivets. In non-ferrous casting plants, the Model 60010 can replace heavy No. 1 chipping hammers. Our patented metering trigger controls 0-4200 blows per minute. Weight - 3 1/3lbs | Air Consump. at 90 psi - 4 C.F.M. Blows per min. - 0 to 4,200 | Dia. Piston - 11/16"
Length Overall - 8" | Piston Stroke - 1 25/32"
Weight - 3 3/4 lbs | Air Consump. at 90 psi - 4 C.F.M. 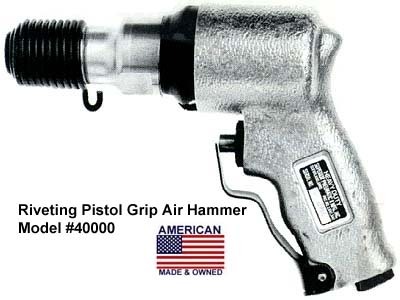 Length Overall - 10" | Piston Stroke - 1 25/32"
The Riveting Air Hammers have a beehive-type spring retainer. The operator can easily rotate the cutting tool in any direction while the hammer is still in use. 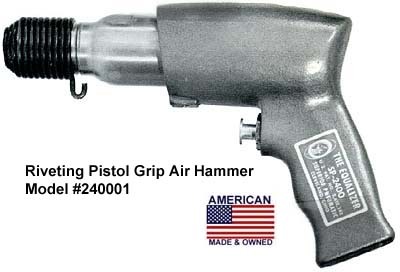 The Riveting Air Hammer can be used for panel cutting, removing drum lids, rivet and bolt busting, setting soft iron or aluminum rivets, as well as a variety of other industrial applications. These hammers use standard .401 Parker Taper Shank Chisels. Our patented metering trigger controls 0-3500 blows per minute. Blows per min. - 0 to 3,500 | Dia. Piston - 3/4"
Weight - 4 lbs | Air Consump. at 90 psi - 4 C.F.M. This Riveting Air Hammer has a beehive-type spring retainer. The operator can easily rotate the cutting tool in any direction while the hammer is still in use. The Riveting Air Hammer can be used for panel cutting, removing drum lids, rivet and bolt busting, setting soft iron or aluminum rivets as well as a variety of other industrial applications. Hammer uses standard .401 Parker Taper Shank Chisels. A fast-hitting air hammer for economical production work. Our patented metering trigger controls 0-3400 blows per minute. Length Overall - 8 1/2" | Piston Stroke - 2 1/2"
These Riveting Air Hammers have a beehive-type spring retainer. The operator can easily rotate, moving the cutting tool in any direction while the hammer is still in use. Sets 3/8" soft iron or aluminum rivets. Also sets 1/4" stainless solid rivets. Easily controlled, slow heavy blow. Delivers just the right impact for riveting, scaling, etc.. These hammers use standard .401 Parker Taper Shank Chisels. Our patented metering trigger controls 0-2200 blows per minute. Weight - 4 3/4 lbs | Air Consump. at 90 psi - 4 C.F.M. Blows per min. - 0 to 2,200 | Dia. Piston - 3/4"
Weight - 6 1/4 lbs | Air Consump. at 90 psi - 4 C.F.M. 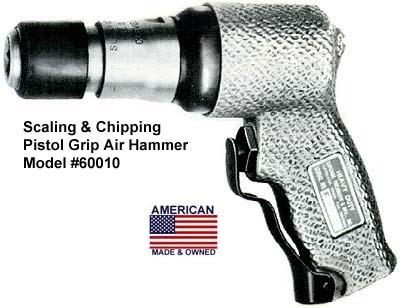 This amazing, American-made air hammer is just the right tool for the job! Ordinary air hammers have too long a piston stroke for boatbuilding. That means that they hit the copper rivet too hard. Even with an adjustable regulator, the ordinary hammer hits the rivet hard enough to cripple (bend) the rivet shank in the wood. The rivet never really takes up (tightens) the wood being fastened together. The result? No joint strength, splitting the wood or leaking. For a solid joint, the rivet must be hit with a sharp, quick, but light hammer blow that will head up the rivet properly without bending the shank or damaging the wood. And that's just what the small, but powerful, Bantam Air Hammer does...time after time. Cuts Riveting Time By Up To 70%! Best of all, with the Bantam Air Hammer you can cut your riveting time by as much as 70%! It's true...riveting time for a typical small boat, which used to take 12 hours of hammering by hand, is cut to just 3 hours with the time-saving Bantam Air Hammer! This hand-size tool, which measures only 5" long x 4-1/2" tall, lets you work in the tightest spaces. 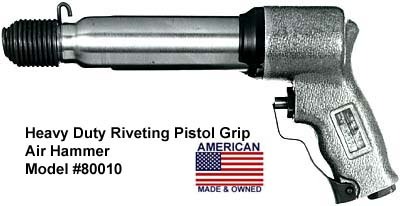 Anywhere you can put your fist, you can install a rivet with the compact Bantam Air Hammer.